The Kill Order is the prequel to the Maze Runner series, of which I have read the first book: The Maze Runner. I would have liked for The Kill Order to be more about the lives of the boys (and Theresa) that we meet in The Maze Runner, but this book is instead solely about a whole new set of characters who are running around in their adventures 20 years before the kiddos are sent to The Maze as we meet them in book 1. In that way, I didn’t feel like this book added much to the series as far as characters. It was interesting to hear more about the sun flairs and what the rest of the world is facing while our characters from The Maze Runner are in the Glade. After the initial interest about oh sun flairs, oh tsunamis, oh a virus, I got rather bored. It’s all death and destruction. I didn’t like a lot of things about this book. It was very action-y, but it lacked characterization. I’m sure this book could be incredibly engaging to many young readers, but I didn’t enjoy it very much. And so much violence. The TITLE probably should have prepared me, but sheesh. Fighting (and killing) scenes everywhere. I got really sick of them after a while. I mean, it’s a survival story, but our characters survive not by being smart or clever but by beating and shooting the daylights out of everybody everywhere. I wanted to like the main character Mark. I know that he loves Trina, feels bad about killing people, wants to live, and misses his family, but that’s about it. Who is this kid? I wouldn’t really have minded if he had died because I wasn’t attached to him. I wasn’t attached to any of the characters, actually. With Thomas in The Maze Runner, I knew everything Thomas knew about himself. We pieced together his mystery of a life together. Not so here. I didn’t even hate the “bad guys.” There weren’t any twists and turns or interesting plot points. It was just…meh. What kept my interest was hoping Mark and Alec could find their friends so something interesting would happen, such as saving humanity. That didn’t happen. But the beginning was interesting! Who are the bad guys? We must find them! Solve the puzzle! Okay, puzzle mostly solved. Time to go kill everyone. And actually, this turned into a sort of zombie movie. Stay away from the diseased people who will kill you in weird ways. If they get you, you’ll become a zombie get “sick” too. And I’m not a fan of zombie stories. Okay, let’s stop ranting. The book is ELL-friendly, is action-packed, and appropriately bloody. I don’t think it’s too graphic to make parents mad. It’s also pretty realistic. In a few hundred years, the sun might flair and cause all sorts of destruction on Earth. The people might react by going nuts as resources are destroyed. It could happen. I made the mistake of reading this book and not realizing it was part of a trilogy. Now I have to read all of them… I’m dying to know, is WICKED good? Mr. Dashner has written a very clever novel. It reminds me of the Hunger Games series, although The Maze Runner came first. They’re similar in that kids (well, teenagers) are forced to fight for their lives while being trapped in a man-made “prison” while at the will of adults. 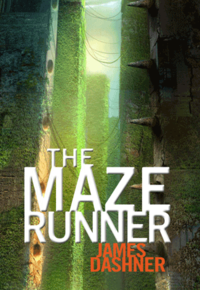 The Maze Runner is filled with mystery and action that keeps you turning the pages, and just when you think you’re figuring it out…you don’t. Gah, cliffhanger endings. What I didn’t like is the lack of female characters. There is one girl throughout the whole novel (until the very end). There may be a plot-related reason for this that will be revealed in later books, so we shall see. This book highlights the strength that young people can have if left alone without adults and how they take care of one another. Power to the kids! They even come up with their own vocabulary which could very well lead to a lesson or discussion about how words evolve.